Gates, unlike fences, are designed to be opened, not by everyone perhaps, but because they are doors they possess a huge range of meaning. For example, there are the ones I call, mean gates, that say, go away stranger, you’re not welcome here and you sure as hell can’t come in. 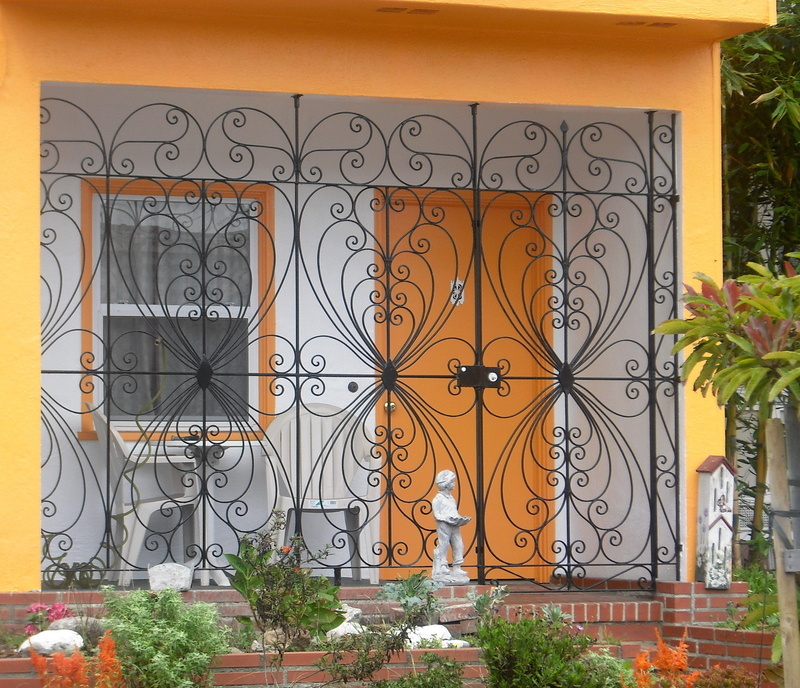 Their message is loud and clear but mean gates have the potential of negatively impacting the neighborhood by making everyone on the street feel nervous and scared when there may, in fact, be no reason for anyone to feel that way. I sometimes wonder about the effect mean gates like that have on the people inside. Does it make them paranoid of their neighbors? Are they fearful of leaving their enclosure? And what if an emergency were to arise and help couldn’t get in or the injured couldn’t get out? Living in San Francisco, earthquakes and fires are real events that should not be taken lightly. Friendlier gates are what I just now termed, peekaboo gates. 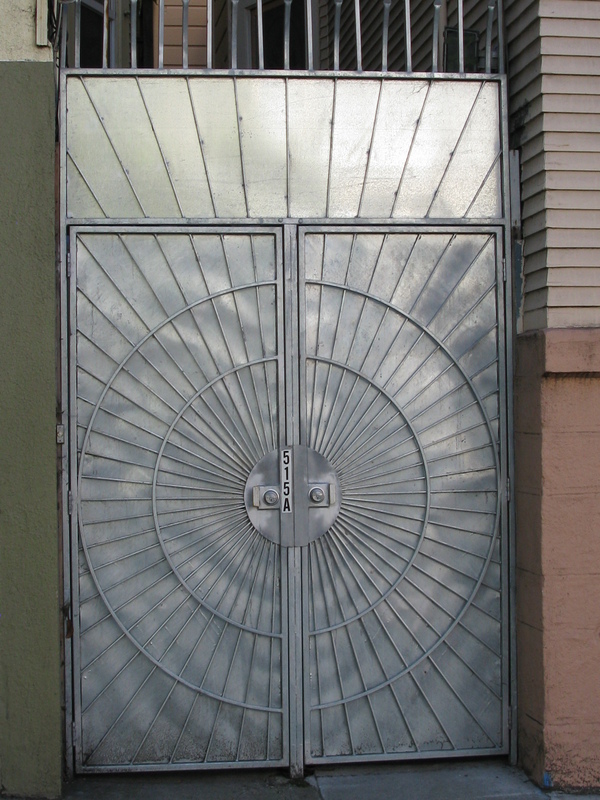 These are the most common types of gate that I’ve seen and consist of tall metal rods or bars bent into various shapes so that passersby can look in and understand the message being spoke is, we’re not hiding, we just don’t want you to come in right now, and we’re a little scared of getting robbed. I have good friends with a gate like that and they are friendly people who are also a little bit scared. Okay, I get that. If people want to put up a gate in front of their front door, it’s no skin off my nose but it does send a message to everyone else that there is reason to be afraid. And fear, like chickenpox, is contagious, which is why it’s so dangerous. There is a self-fulfilling prophesy that goes with fear and the more it spreads the more likely something bad will happen. For some people, it’s practically a “dare”; a invitation to see if you can get in. Now I’m not the type of person who entertains dares but there are a lot of folks out there who do, they see a challenge and they want to overcome it. Some will climb Mt. Everest and some will want to break through a gate. 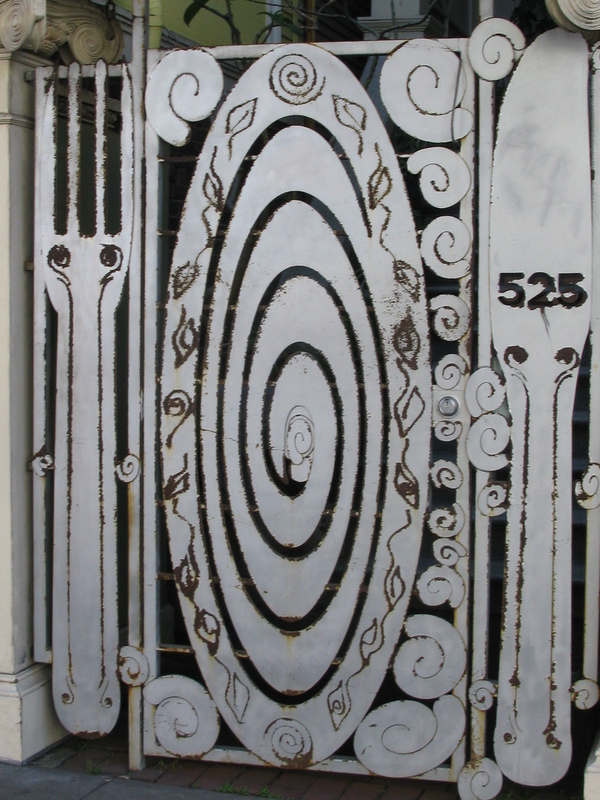 My favorite gates are whimsical, playful, short and open. I like an invitation to come in and let my intuition answer. 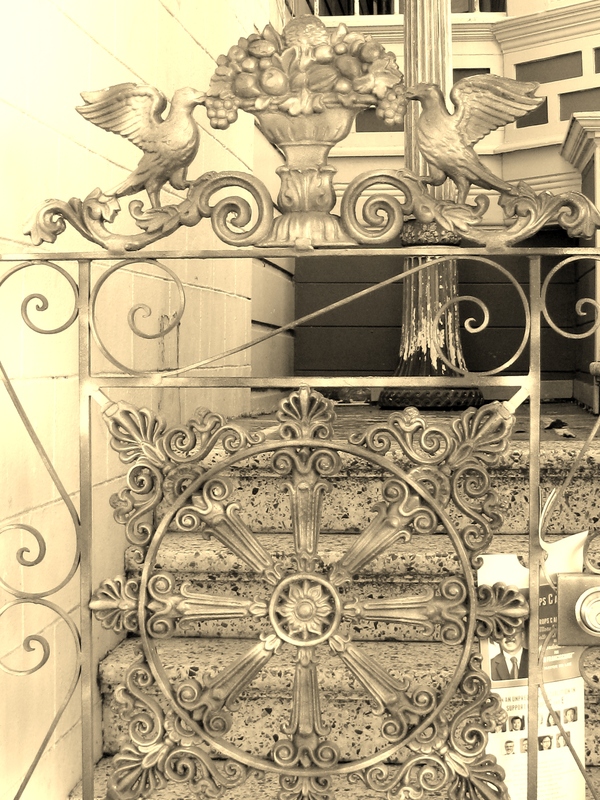 I like gates that let my eye enter so my curiosity is satisfied even if I’m not invited inside. I like gates that stimulate my imagination, that distract me from their purpose. I like gates that go nowhere or create options to enter. Gates are expensive and having not had a paying job in almost two years, I understand the motivation of getting a cheap gate that does the trick as opposed to creating something purposeful from scratch. My question to the potential buyer is, do you really need it or would a better solution be to create community in your neighborhood; are you acting out of an irrational fear that needs to be acknowledged and addressed or is there a real danger in your neighborhood? Whatever your answer maybe, remember the manner in which you show your house is the manner in which you want your neighbors to regard your house as well. 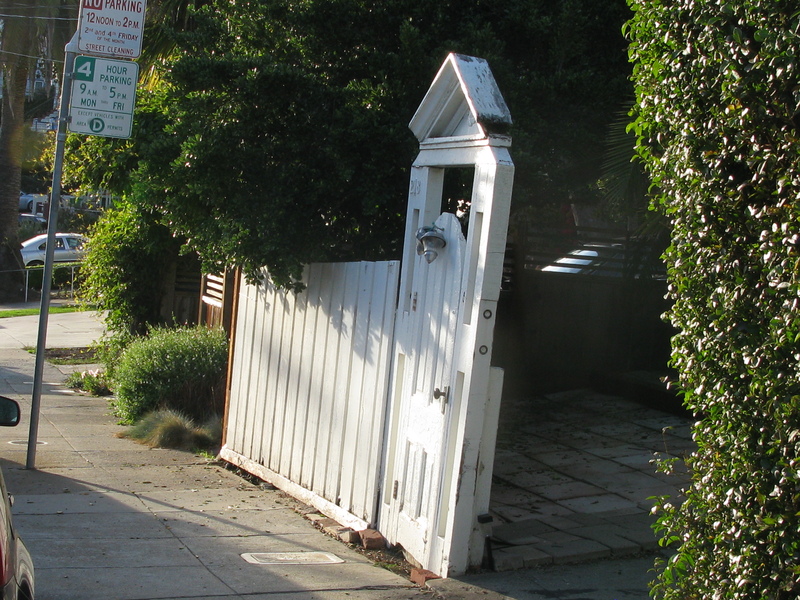 This entry was posted in Uncategorized and tagged community, Design, gates, neighborhoods, safety, whimsical. Bookmark the permalink.